Author of the 'Craft Marketing Done Right!' book. Author of Craft Marketing Done Right! How To Turn Your Hobby Into A Money Making Business. Do you have a business selling products? Are you a craft maker or have a hobby making unique items? Thinking about quitting your day job and working from home instead? Are you ready to start making money with your own business? If you said 'Yes!' to any of the above questions than you're at the right place. Silke Jager is a blogger and the author of the Craft Marketing Done Right! book. 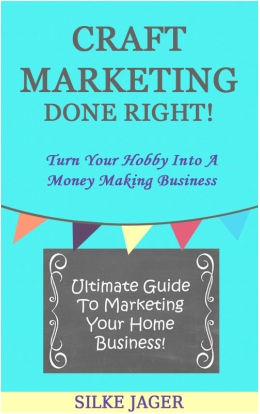 A comprehensive marketing book for artists, craft makers, hobbyists and small business owners. With the help of this marketing book you will be able to start making money selling products from the comfort of your own home. Silke knows how to market a home based business and is sharing her years of experience as a writer, blogger, craft maker and small business owner. Through her book Silke will be teaching you everything you need to know about marketing your small business. You will be making a positive impact on your sales and learn the best ways to connect with your customers before and after a sale. Start, manage, and market a successful home based business selling your products! This [Craft Marketing Done Right!] book is perfect if you are a crafter like me and want to make some money from your hobby! I really enjoyed this book as it gave me many marketing ideas. The author is very informative on how the process works and offers many tips on what to do to make your business dreams come true. If you have ever entertained the thought of turning your own hobby or idea into a profitable business than you are not alone! The outline of the Craft Marketing Done Right! book was written in January while we were house sitting in Belize. It took another nine months to complete the project and release the final version. Where are the best places to find the real scoop on Silke? Silke Jager's Lifestyle Blog, free travel & DIY tips, cooking videos, reviews and lots of fun articles and pictures. Silke Jager's DIY blog, an up-cycling glass bottle crafting community. Silke Jager on Tech Cocktail, one of the top blogs in the world focusing on entrepreneurs, technology and innovation. It can sometimes be a daunting task thinking about what's involved when you think about the move from a hobby to actually turning it into a small business. After starting the book, you are shown you can do it step by step and it really isn't that difficult. Contact Silke Jager with your questions, share your own marketing stories or find out about the different services she offers. Here's where you should go to learn more.